Remember when you were a kid and played "I Spy with my little eye something beginning with. ..."? We played it on all long car trips until we drove our parents crazy. Now in the car, we have Navman, smartphones, iPods, laptops and DVDs for the kids. Bring back the innocence of a non-tech game and give yourself some peace and quiet. 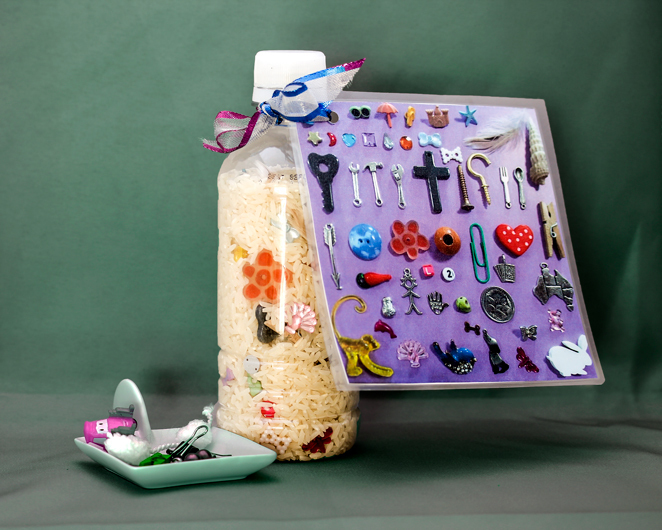 The rug-rats will love playing with the I Spy bottle for hours. Keep it in the car or for the non-proverbial rainy day. They are easy and cheap to make. You can have several, for different ages, or just for variety so they don't get bored. An added bonus is that the kids' father will happily play with one too. They can be made by the kids as well as for them. 1. 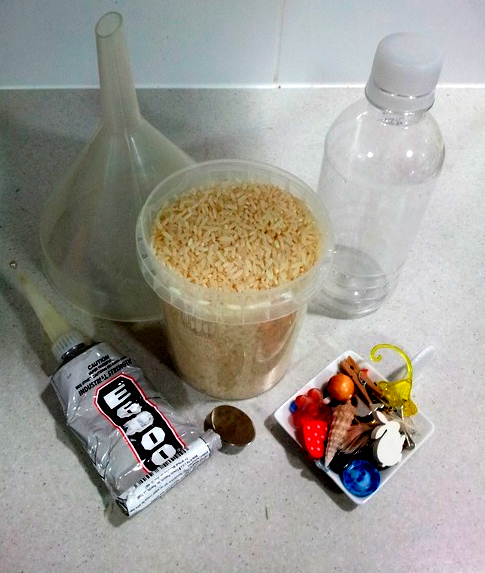 Collect dozens of little items to put in the bottle to be "spied" or discovered among the rice. I used beads, charms, single earrings and buttons from my jewellery making; embellishments from my scrapbooking stash; little toys and items found around the home. You can use anything that you like so long as it is small enough to fit into the neck of the bottle. Think wee dolls, teeny cars, all those annoying items you are forever picking up around the house like odd doll shoes, coins, Lego or UFOs (Unidentified Forgotten Objects). You are only limited by your imagination. Let the kids contribute their own treasures. I suggest you choose a variety of shapes, sizes and colours to make it more interesting. Clear and white items are hard to find in the rice. Here I used about 50. The number and type is up to you. It is best not to use anything organic (other than the rice) which may deteriorate like acorns or leaves. Although I do add a feather to each bottle. 2. Place each item onto a piece of paper or card. 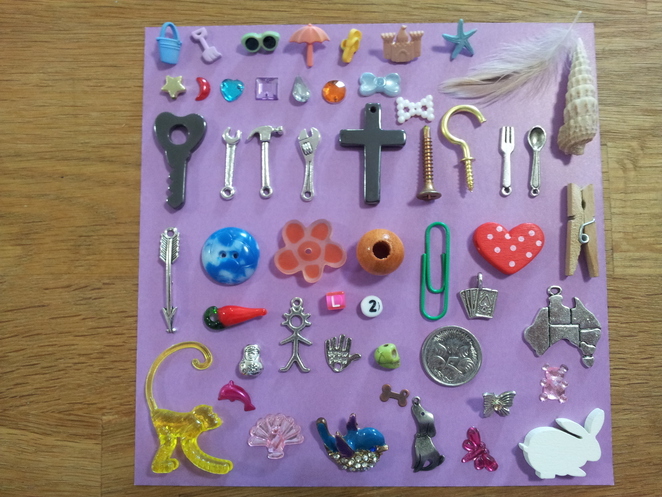 Take a clear photo of the trinkets on the paper then print it in colour. I laminate the photo to make it kid-proof and durable (or you can print spares). This one was made for Little Lolly who is 3. For older children who can read you can type or write the name of each item. For those learning to read, like Miss Millie, aged 6, I have pictures on one side and words on the other. 3. Remove the label from the water bottle and ensure that it is completely dry. You can recycle jars or any bottle but plastic is safer and light-weight for little hands. 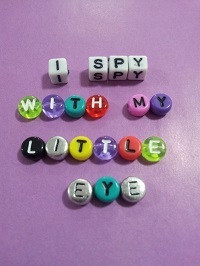 You can even make mini I Spy Bottles out of sample shampoo bottles, or similar, to put into pockets or carry in your bag for when a distraction is needed. 4. Use the funnel to pour in some rice. Add a few little items and then more rice. Continue in layers until the bottle is not quite full. This is not an exact science so don't sweat how you do it. Just leave enough space at the top to allow the rice to freely roll around and be shaken. 4. Glue the lid on. I used E6000. This is an important step, as kids being kids are sure to want to take the trinkets out of the bottle. Taking the lid off could pose a choking hazard and you'd be cleaning up rice for days. 5. Tie the printed picture (or a typed list of words) with ribbon or string to the bottle neck. Voila! You are ready to play I Spy and discover new little-hidden treasures. Have fun and get creative with your I Spy Bottle(s). For example, you can make a Halloween bottle with scary little knick knack skulls and pumpkins; or a Christmas one with red, green and gold (in a clear bauble with mini Santas, canes, snowflakes, tinsel and so on). Colour-themed bottles is another idea with all the trinkets in one colour-way. 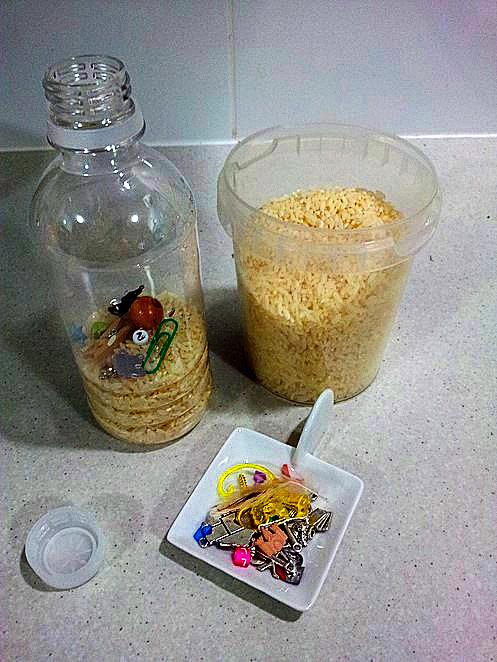 If you have children learning their alphabet, or to count, try putting letter or number beads in the bottle. Fun AND educational. Why? Hours of quiet fun for all ages. When: Whenever you want the kids to play quietly e.g. car trips and rainy days. Cost: Negligible if you make it from items that you already have at home.